Running on your record, Mr. Harper? 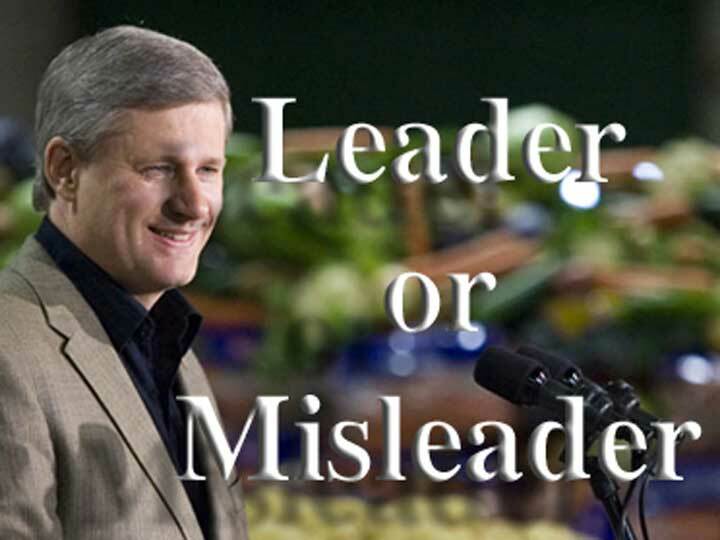 Is Mr. Harper a leader or a misleader? Under Mr. Harper, Canada has lost hundreds of thousands of quality jobs in manufacturing and lumber. On health and safety, ignorance and denial escalated a nuclear safety issue into a world-wide medical crisis. Several Canadians died of Listeriosis because of Harper deregulation. Environmentally, Mr. Harper has become the world?s pariah - excepting the US Bush Administration's approval. Military deaths in Afghanistan escalated radically. The war is mismanaged. Rather than governing well, Mr. Harper spent two years and millions in character assassinations and suing his opponents, including Elections Canada. Elections Canada ruled that Mr. Harper, sixty-seven conservative candidates, plus their financial agents violated election law. Mr. Harper says he is a law and order guy, but he did not play legally with our most fundamental institution - democratic elections. Now, Mr. Harper is spending millions to tell us he is a man that loves his children. However, in public life he has proven he does not love the truth, does not think the law applies to him, and is utterly incompetent at managing a government. Mr. Harper is a misleader.